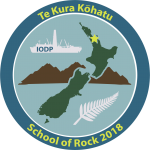 2018’S PROGRAM: TE KURA KŌHATU – SCHOOL OF ROCK! Where: Auckland, NZ. This was a land-based program. The program began with the port call of the JOIDES Resolution, during which participants toured and worked on board the vessel. During the days that followed, participants took part in related lab and field trip activities around Auckland. What: 2018’s School of Rock was jointly organized by the United States Science Support Program (USSSP) and the Australia and New Zealand International Ocean Discovery Program Consortium (ANZIC). It focused on Pacific Rim geology and the science research of theJOIDES Resolution. Field trips explored the fascinating geological history of the Auckland region, including arc and intraplate volcanism (Rangitoto Volcano above), and deep sea sedimentary processes. In our continuing goal to broaden participation in the geosciences, we were especially interested in applicants from diverse backgrounds and/or who serve diverse communities. Applicants were required to provide strong and realistic ideas regarding how they will disseminate the information and resources they gained as a result of School of Rock and enhance the capacity of their schools and communities to provide this cutting edge science to a diversity of learners.